Quinoa is a Great Vegetarian Protein Source! Many people are making a decision to eat healthier, eat less meat or none at all. The question that I’m asked the most about my vegetarian lifestyle is “What do you do for protein?” There is a big misconception that protein is only found in meat. Protein is found in nuts, seeds, legumes, beans, vegetables, fruit and whole grains. One whole grain to stop and talk about is quinoa. It’s not only high in protein, fiber, rich in vitamins and minerals, it’s also a complete protein! Just one cup of cooked quinoa contains 18 grams of protein, as well as nine grams of fiber. 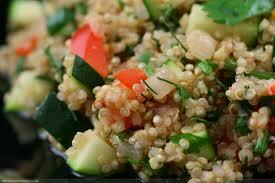 Quinoa is very versatile, it can be cooked in soups, made into a salad, veggie burger, breads etc. go out and try some here is a link to some recipes. « Previous Post 10 Simple Ways to Detox! Next Post » RIL Fitness Tip! Eat a Protein and a Carb with Every Snack!